Sometimes open positions require candidates to reside close to the company that is looking for that profile. Opus geographic location automatically extracts the addresses in the cv that correspond to the residence and domicile of the applicant. Opus clearly distinguishes these from other addresses that may be present in the curriculum, such as those of the companies where the candidate has worked, that are required by the European curriculum asset. It is essential that these additional addresses are not considered at the time of the analysis of the CV, because they could lead to false positives and find workers as residents in a certain area if they worked there previously. Opus locates the city of the candidate and not the full address, which could not be fully shown in the maps and then not give good results. Once identified, these addresses are geolocated on OpenStreetMap, an open online service map that is accessible through Opus and makes immediate visualization of the candidate’s position. Of course if the CV does not contain this information it can be added to the candidate profile by the recruiter. 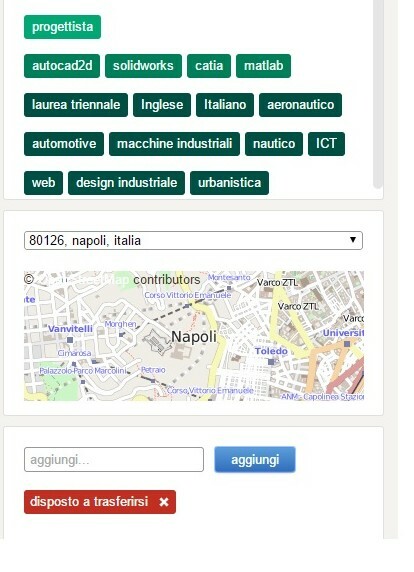 When you reasearch CVs through the filters of semantic, you can therefore define a precise area of the candidate origin (or open multiple searches areas) in order to ensure in the selection phase the candidate geographic location, all without having to enter data or make further selections.